October 2015 – I'd bookmark that! 1.History…Often the nightly news becomes a meaningless drone in the background. One thing though that has been impossible to ignore is the flow of refugees into European countries from the middle east. The first website I have for you takes that data of refugee flow and presents it in an awesome way…. 3. Ahhhhhhh…..here’s something I’m even LESS qualified to talk about…..Relationships. Fun site that lets you enter two movies and comes up with suggestions you may both enjoy. 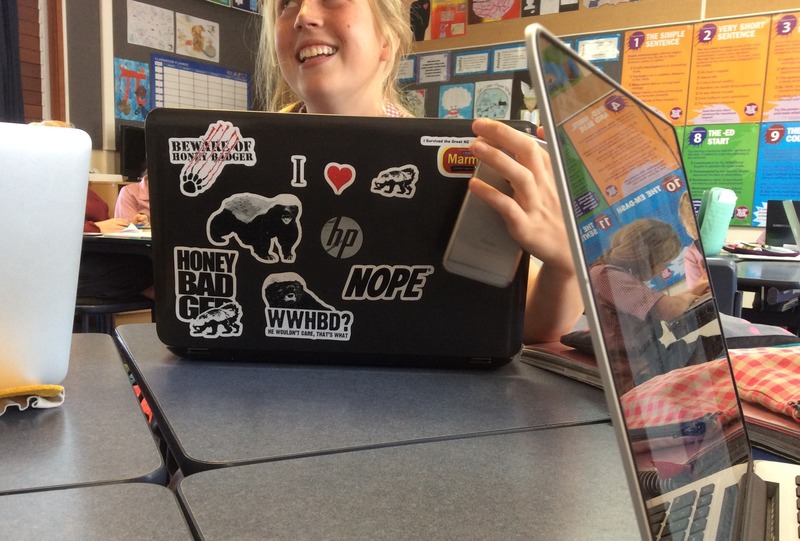 In the words of the Honey Badger…”Honey badgers are brutal and we need to be aggressive as this term comes to a close with our examinations just like the crazy honey badger!” Thanks Monique. Last week I featured the theme song from Welcome Back, Kotter – this week it is the chance for W.K.R.P in Cincinnati to shine. This was the show that had something for everyone. With characters like Arthur Carlson, Bailey Quarters, Les Nessman, Jennifer Marlowe, Andy Travis, Herb Tarlek, Johnny Fever, Venus Flytrap….did I mention Jennifer Marlowe? 2. Physics – ah, my old nemesis……Physics and my brain have a cautious relationship. I love to read about Physics, but then my head hurts. 3. News and Current Events – This is VERY impressive. An interactive heatmap of world news. You can choose from today, this hour, or even go to a specific date in history. Then click on the hotspot for nutshell news and loads of related articles. Just wow. Hope you all had a recharging couple of weeks! I went to ULearn conference during the last week of the break and picked up a few gems that I will share over the next few weeks. They had also never heard of W.K.R.P in Cincinnati or The Mary Tyler Moore Show. Imagine my shocked face! I liked those shows, mostly for the theme music…they just seemed better back then. So for those who haven’t heard it, here’s the theme from Welcome Back, Kotter…. A great site, developed by anime artists, that takes any picture and automatically enhances it for you. It’s all about that image resolution. 2. This one time at bandcamp….. Here’s a music finder that links to awesome newer artists and allows you to support their work. 3. And finally, some Study Flashcards. Either make you own or search the bank of material available!